Scientists studied the growth of rock features at Angel Terrace, Mammoth Hot Springs in Yellowstone National Park. At left is a pond of 1 m in diameter, and at right is a travertine dome of 50 cm in diameter. The rock structures can be explained using a generic model based on broad physical principles. Photo credit: APS. Although nature’s landscape is constantly changing, scientists have discovered that it does so in a predictable way. During the formation of ponds, terraces and rock domes at geothermal hot springs, the fluids and chemicals that form these structures act in such a regular way that scientists have developed a simple, generic model to explain the growth of structures near hot springs. When hiking along stepped rocks in a nature preservation, it might seem natural to assume that the rocks have taken eons to form and will retain their shape until the end of this age. At geothermal hot springs, however, rocks are no more permanent than the water that flows over them. In fact, some of the rocks in these wet locations “grow” up to 5 mm per day due to 150-degree-Fahrenheit water emerging from ground vents. The hot water releases carbon dioxide which precipitates travertine – a form of calcium carbonate – that flows over the terrain, modifying the rocks as well as future flow paths. Although the rock motifs may look randomly arranged by precipitation, scientists are continually discovering more patterns to the growth formations. In the past, scientists thought that the rock architecture surrounding calcium carbonate springs (either hot or cold) could only be explained by detailed analysis of the crystal structure, water chemistry, and perhaps the metabolic activity of the microbes that populate the spring water. Now, scientists from the University of Illinois suggest that large scale structures near hot springs can be understood using a simple, generic model based that depends not on such specific details, but rather on broad physical principles such as the dynamics of fluids, precipitation and crystal growth. Scientists Nigel Goldenfeld, Pak Yuen Chan and John Veysey, whose research appears in a recent issue of Physical Review Letters, studied various travertine formations at Angel Terrace in Mammoth Hot Springs, part of Yellowstone National Park in Wyoming (see photos). 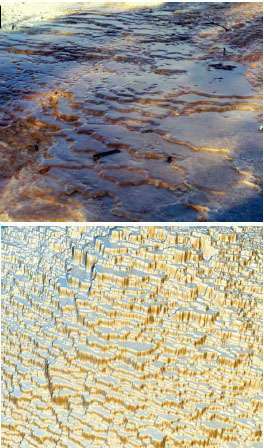 Scientists produced the simulation (bottom) of a typical rock landscape near hot springs as predicted by their theory. The simulation, with its distinct crevices and terraces, closely resembles the field observations (top). Photo credit: APS. The basis for the scientists’ claims is that visual and quantitative aspects of the rock formations can be reproduced by mathematical and computational models. In particular, the team identified instabilities of the combined fluid flow and growth process that naturally predicts the occurrence of ponds, terraces and highly symmetric domes, also found occasionally near hot springs. To explain any fluid flow, scientists traditionally use the Navier-Stokes equations. Although the equations work for simple situations, for complex situations such as the rock formations described here, the equations become so difficult that even supercomputers can’t solve them. (A million dollar prize is even offered to whoever can unlock the complexities of the Navier-Stokes equations.) The team found they could simplify the equations for this particular situation by making approximations and even neglecting some variables, and were able to predict depositional instability, size and shape that closely matched those of the observed ponds, terraces and domes at Mammoth Hot Springs. Goldenfeld, who was part of a research team that recently made large strides in understanding the dynamics of turbulence – considered the last major unsolved problem in classical physics – added that this current research builds from the turbulence research for several reasons. The scientists also expect that this study of the pattern formation caused by travertine precipitation in hot springs could lead to other research areas on even larger scales. The scientists speculate that future studies will reveal more universalities among terraced landscapes, and possibly point to a more detailed understanding of the statistical properties of these landscapes. Reprinted figures with permission from Goldenfeld, Nigel, Chan, Pak Yuen, and Veysey, John. “Dynamics of Precipitation Pattern Formation at Geothermal Hot Springs.” Physical Review Letters 96, 254501 (2006). Copyright 2006 by the American Physical Society. Readers may view, browse, and/or download material for temporary copying purposes only, provided these uses are for noncommercial personal purposes. Except as provided by law, this material may not be further reproduced, distributed, transmitted, modified, adapted, performed, displayed, published, or sold in whole or part, without prior written permission from the publisher.